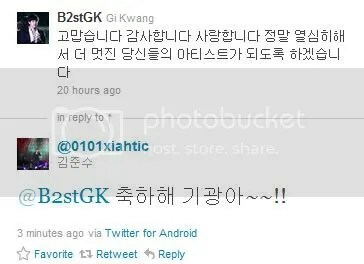 B2stGK : Thank you, thank you, I love you. We will work really hard to be a better artist for you guys! Junsu: Congratulations, Gi Kwang-AH ~!! Jang Woohyuk is set to venture in his first acting challenge, as he is set to be a male lead for an upcoming Chinese drama. He initially announced it on his official me2day account, telling his fans to cheer for him in his first acting challenge. He also uploaded a self-taken photo of himself arriving in Beijing, China. Despite being inexperienced in the acting field, it was further revealed that Jang Woohyuk’s popularity and strong fanbase in China urged him to accept the project. He will play the lead role in the drama “My Sileok Girlfriend”, a romantic comedy that portrays the tale of Woohyuk’s character, coping with a girlfriend who has lost her memory. Jang Woohyuk will film the drama within three months. The drama is aimed for broadcast in the middle of next year.